N252TA of TALON AIR SERVICE. • IM-1732 Indian Air Force. Delivered 24-Apr-1958. Served with 41Squadron (Otters) probably throughout its IAF career. During 1962/63 was involved in supporting Indian troops in their battle with the Chinese, who invaded the Walong region in November 1962. It was subsequently based at Palam Air Base, New Delhi during the years 1976 to 1980. Withdrawn from Army service on 31-Mar-1991. Total time: 7,469 hours on the airframe. Note: Rebuilt at Saskatoon, SK., by T. C. Aviation. • C-FTKA La Ronge Aviation Services Ltd., La Ronge, SK. Regd 18-Oct-1994. Power Plant: Converted to Texas Turbine Garrett-engine late 2002 & early 2003. Otter 252 was delivered to the Indian Air Force on 24th April 1958 with serial IM-1732. After test flying at Downsview, it was packed into a crate and shipped to India where it was re-assembled and entered service. All that is known of its Indian service is that it flew with 41 Squadron during 1962/63 and was involved in supporting Indian troops in their battle with the Chinese, who invaded the Walong region in November 1962. It was subsequently based at Palam Air Base, New Delhi during the years 1976 to 1980, again with 41 Squadron. The Indian Air Force continued to fly the Otter until the type was formally withdrawn from the inventory on 31st March 1991 and the surviving aircraft offered for sale. The successful bidders for the Otters were Mike Hackman Aircraft Sales / La Ronge Aviation, who travelled to India to prepare the aircraft to be shipped back to Canada. IM-1732 was one of five Otters located at Barrackpore Air Base and had 7,469 hours on the airframe. It was one of eight Otters shipped from Calcutta, by sea to Vancouver and thence overland to Saskatoon where they arrived 30th April 1994. The Otter was rebuilt at Saskatoon by T. C. Aviation and was registered C-FTKA to La Ronge Aviation Services Ltd of La Ronge, Saskatchewan on 18th October 1994. 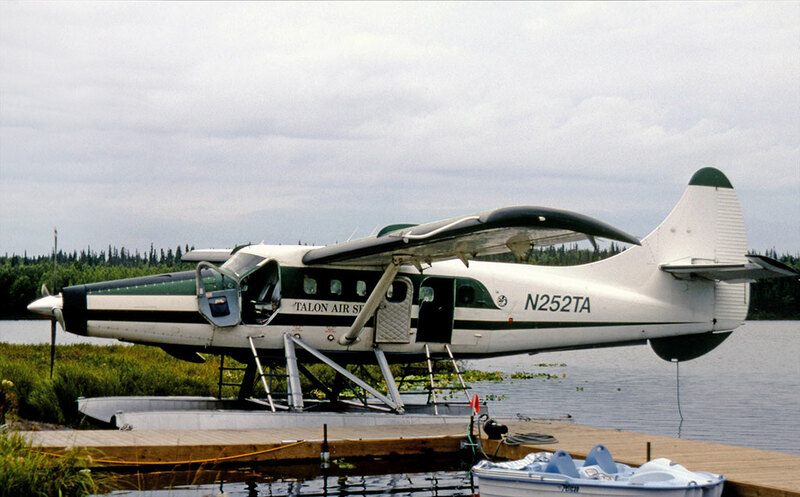 The Otter was put up for sale and the Canadian registration was cancelled on 8th March 1995 on the sale of the Otter to Talon Air Service Inc., of West Mackey Lake, Soldotna, Alaska to whom it was registered N252TA. It served the tourist industry from its base at Soldotna during the summer months, flying tourists, hunters, fishermen etc. It was stored during the winter months, usually at Anchorage. At the end of the summer 2002 season, the Otter made the long flight south to Decatur, Texas where over the winter it became the sixth Texas Turbine Garrett-engined conversion, returning to Soldotna in time for the summer season of 2003.